GoPro, Inc. (NASDAQ: GPRO) has added a new HERO camera to the family. On sale now, HERO is at Rs 18,990, go-anywhere, capture-anything camera that makes it easy share experiences that would be difficult to capture with a phone. In India, HERO is available exclusively at Flipkart. “We are delighted to be a part of this exclusive partnership with GoPro. GoPro HERO adds to our world class selection and will help strengthen Flipkart’s dominant leadership in cameras. At Flipkart, we have a big customer base of passionate travellers & outdoor fans that are becoming more and more important. 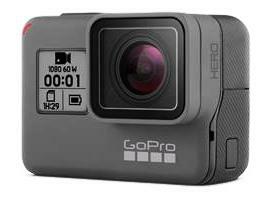 Along with GoPro we want to give them the perfect camera to capture their adventures”, added Adarsh Menon, Vice President and Head-Electronics and Private Labels, Flipkart. To learn more about the entire GoPro lineup including the Rs 37,000 HERO6, Rs 28,000 HERO5, Rs 18,990 HERO, visit GoPro.com. To see new video announcing HERO, visit news page.